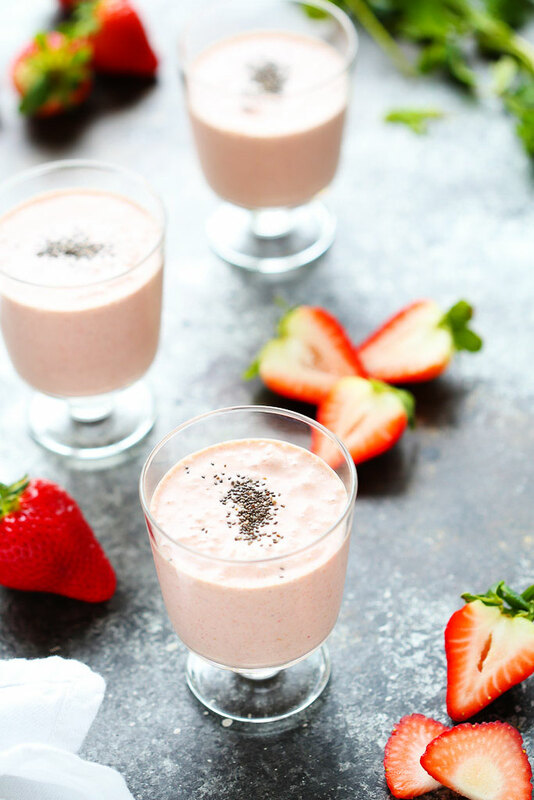 These Healthy Strawberry Shortcake Smoothies make that justification totally possible. They’re dairy free, loaded with fresh fruit and natural protein, and will keep you satisfied until lunch – when you can go looking for a brownie in the break room again. I’m using coconut milk instead of dairy-milk to give an extra creaminess and richness to this smoothie – This is the canned coconut milk, not the refrigerated kind that you’ll find in the cartons next to the regular milk. It’s thick, creamy and perfect for making these smoothies extra silky and decadent. And, to add in the flavors of baking spices that you’d typically find in a white cake, I’m throwing in some nutmeg, cinnamon and vanilla extract.. Those three flavors are like a big warm hug to me. A spoonful of almond butter adds some protein and additional richness to the smoothie, along with flax seeds to add some omega-3 and fiber. Feel free to swap out the chia seeds for your favorite nutritional boost – Hemp seeds or flax seeds would work here as well. Also, if you don’t mind your smoothie turning an unappealing shade of brown, you could also sneak a handful of spinach or kale in here too. 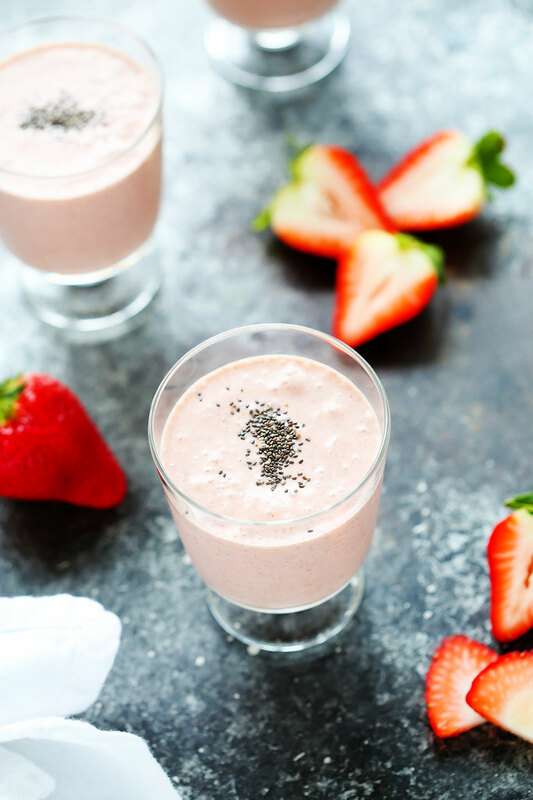 The dessert-fiend in me would jump out of bed every day for one of these Healthy Strawberry Shortcake Smoothies! What helps to get you going in the morning? This looks like the perfect way to start the day to me! Love smoothies like this! Coconut milk makes the best smoothies. My kids love these kind of smoothies too! Thanks Marlynn – This is definitely a kid-friendly smoothie – So yummy! Hey Erin! I’m looking for a background board really similar to yours in these photos and was wondering if you bought it somewhere or if you made it!…? Hi Jessie – This is the one that I use: http://ericksonwoodworks.com/products/cookiesheet – I love it! Their boards are super high quality.